Punjab is considered as the granary of India. The main crops are wheat and sugarcane. Three harvest dances are performed in Punjab and all of them are associated with wheat cultivation. The most popular and widely known dance is Bhangra. Next to it is Jhumar. The Karthi dance is performed more in the hill region. Bhangra is one of the most virile dances and is danced only by men. After the wheat seeds are sown the Bhangra is performed in the full moon night. First of all, in an open place in the village the leading drummer plays Dhol, the drum with two faces. One face is played by the fingers, the other face is played with a blunt stick. The rhythmic phrases played on the Dhol is indeed exhilarating. Hearing the drum beats dancers come and gather in the open place. 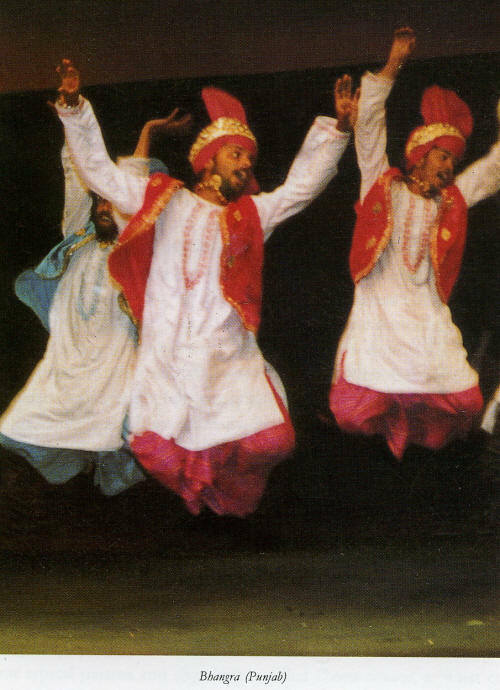 A Bhangra dancer wears lungi, a Kurta, a waistcoat, and a turban. The dancers wear colorful dress. The Dhol (also called DholaK) player is the leader. He is joined by a pair or more of vocalists who sing couplets of folk song called Boli or Dhola. After a couplet or two the stepping changes and the dancers shout with great zest the typical refrains like Bale-Bale, Oai-Oai, and Uhun-Uhun. Various kinds of stepping are there in the repertory of Bhangra. Acrobatic elements also spice up the dance. The main inspiration for Bhangra comes from the enlivening drum music. Earlier no other musical instrument was played with the dance. Nowadays idiophones like cymbals and Chimta are being used. The melodic content is only singing. No melodic musical instrument is played with Bhangra dance.